Home » Pseudosexual » Can an Image Tell Me if I have a Perverted Mind? Can an Image Tell Me if I have a Perverted Mind? Click bait. When I see it, I hear Gollum’s voice in my head: “We hates it.” If I ever see a link with one of these headlines again (pulled from Zerone’s aptly titled You won’t believe how these 9 shocking clickbaits work! (number 8 is a killer! )), it’ll be too soon. A school girl gave her lunch to a homeless man. What he did next will leave you in tears! Can you solve this ancient riddle? 90% people gave the wrong answer. 9 things noone knew about Princess Leia. Number 7 will blow your minds! But dangit, sometimes it works. Sometimes, it strikes my curiosity. Sometimes I click. I guess that’s the point: like Nigerian scammers, one sucker in ten million still makes a profit. As a relatively tech-savvy geek, though, I don’t usually click. I don’t want to reward that behavior. So if I’m particularly curious I’ll try to Google to find out what happens next, if I can be in the 10% of riddle solvers, or if I need to turn in my geek card because I totally didn’t know that about Princess Leia. Are you a pervert? What you see in this illusion will tell all. Okay, so I like to consider myself a refined, highly-targeted pervert. I mean, I literally write about sexually-charged Christianity as a hobby. This site has a section literally called “TMI”. I know I’m a pervert. But I was curious. Could this illusion tell? Spoiler alert: it could. I’m a total pervert. 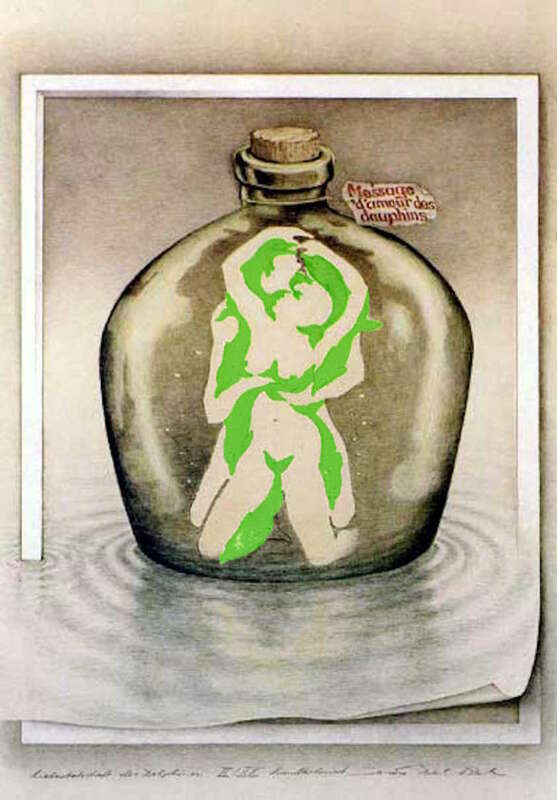 The test was a brilliant optical illusion called “Message d’Amour des Dauphins” by Sandro Del-Prete, a man who seems quite gifted in producing images that trick the mind. If you’re like me (and anyone, I suspect, over the age of 14), your mind clearly draws sexual imagery from the optical illusion. If you’re younger, you probably see a bunch of dolphins. If I try hard, I count nine dolphins. One I’m not sure about. This got me thinking a bit philosophically. Asking questions about my reality, or at least the perception of it. Perhaps it’s mere perversion that made me have to hunt for the dolphins. I’ve got a “sick mind” like some click bait sites suggest on this. Perhaps it’s merely a byproduct of exposure to various adult experiences and imagery. Perhaps my mind simply followed the deliberate path set forth by the artist, with the dolphins being like that sailboat, paper clip, and hammer in that picture in the Highlights magazine: merely incidental additions to an existing portrait. I’m genuinely curious if my underage children would see dolphins. Not curious enough to find out, but curious nonetheless. Regardless of what’s informing my bias, I won’t show it to my kids because it is a sexual image in my mind. I can recognize the possibility that it might just be dolphins to them, but my reality says it’s a graphic image. So that’s just out of the question. That is what Einstein might have called my “very persistent” reality about this illusion. Either way, I’m still a pervert.